Morris Karer, right, from Chef Ras Kitchen is giving out samples to Maya LeValley and Toni Gourley during the Flavor of Central Texas festivities Tuesday evening. 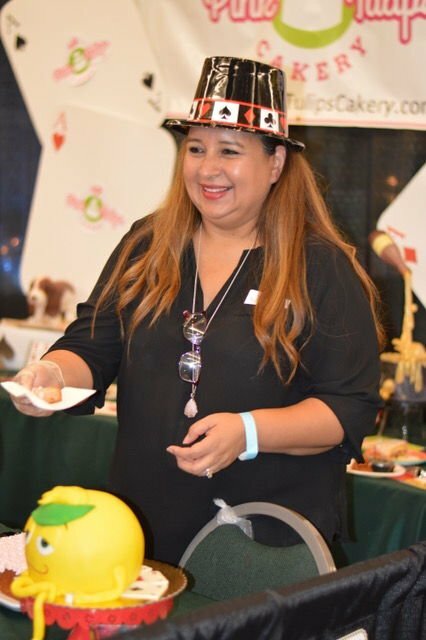 Silvia Saiki from Pink Tulip is giving out cake samples at the annual Flavor of Central Texas event at the Killeen Civic and Conference Center Tuesday evening. Travis and Christine Stannard enjoy trying different food from local restaurants during the Flavor of Central Texas festivities Tuesday evening. Over 1,000 guests enjoyed delicious samples of local restaurants, caterers and bakers at the 10th Annual Flavors of Central Texas festivities Tuesday night in Killeen. The culinary event was organized by the Greater Killeen Chamber of Commerce. Nearly 50 vendors treated their guests with samples of their food under the roof of the Killeen Civic and Conference Center and gave them a glimpse into what their menu has to offer. Visitors of all ages enjoyed the food options and took the opportunity to discover new restaurants in the area. “Everyone put a lot of work in their food and the serving sizes are very generous,” said Amanda Neutkens, who visited the event with her 14-month-old daughter Felicity. Travis and Christine Stannard just moved to the Killeen area and wanted to take the opportunity to find out about good restaurants in town. “It’s a lot of fun … and it’s great to find out about the restaurants in the area,” she said. Guests were able to choose from chain restaurants and bakeries like Chick-fil-A, H-E-B, Walmart and Freddy’s Frozen Custard as well as family-owned establishments like Tulip Cakes, Sweet Eats Bakery and Ocean Mouf Seafood Bistro. 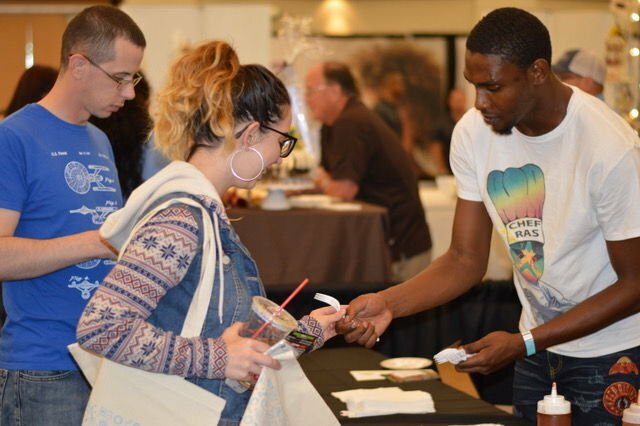 Attendees could discover foreign delicacies and cuisines from all over the world. Silvia Saiki from Pink Tulips Cakeray in Harker Heights let people know about her business and the sweet treats it provides. “We just like to come out here and let people taste our food,” she said. Visitors were also able to enjoy live music entertainment, massages, raffles and a giant escape room. “We take you and your friends and family into a theme room and you have an hour to solve the puzzles and clues to eventually come out,” said Michelle Smith from The Great Escape Room Central Texas. Tickets cost $22 per person and can be booked online, in person or on the phone. A military discount applies for everyone with an ID card. Laura Galipeau visited the event for the fourth year and enjoyed the variety of activities. “I love it because it gives you the opportunity to try places you normally wouldn’t go to,” she said. Visitors were also able to vote for their favorite vendors in multiple categories. H-E-B won the best decorated booth with its True Texas BBQ; Cheddars was voted to have the best app, while Nothing Bundt Cakes served the best desserts and the catering service Let Us Do the Cooking offered the best entree with garlic mashed potatoes and burgundy beef tips, officials said.